Information: Advanced Passenger Train technology was the way of the future on British Rail during the late 1970’s and early 1980’s. Since the Modernisation Plan was implemented during the late 1950’s, it was intended that eventually high speed rail travel in Britain would be via over-head electrical propulsion. 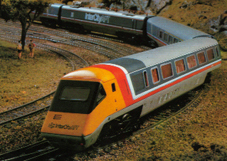 The APT train proved a commercial and political failure resulting in the interim designed HST formations still being in daily use 30-years on. Details: Plans for an advanced passenger train network were in advanced stages by 1970. These plans provided for electric Advanced Passenger Trains to be used through-out the network over the next 20-years. Diesel electric HST train sets; designed as a stop gap measure until sufficient APT’s could be delivered, were capable of 125-MPH speeds. The intent of the APT was to rival the French and Japanese technology of higher speeds still; increasing operating speeds on the East and West Coast Mainlines to 155-MPH. Although not a problem on the East Coast Mainline (ECML), this goal would be problematic for the route of the West Coast Mainline (WCML) due to tighter radius curves being present. The APT was designed to over-come the restrictive curves by employing a unique hydraulic tilting mechanism. Other features of the train were the fact that trailer coaches were to be articulated and a unique water turbine braking system was to be employed. A team of former aviation industry engineers were employed at BR Derby Research for the project, headed up by Professor Alan Wickens. The project was to take place in three stages; APT-E experimental prototype, APT-P production prototype, and APT-S production series. The APT-S never materialized. Introduced in 1972, the prototype APT-E was a gas turbine powered unit intended for experimental trials only. Deemed successful, by the mid-1970’s three Class 370 APT-P sets were under construction ultimately to be employed in revenue service on the WCML. Under test in 1979, one unit recorded a new speed record for electric traction, reaching 162-MPH (260-K/mh). Political pressure to get the trains into revenue service was part of their undoing. On 7th of December 1981 during the first public service, the trains tilting mechanisms failed sporadically while the water turbine braking system froze-up due to adverse December temperatures. These failures were duly reported by contemporary press releases. Four days later the trains were removed from active service “until further notice”. It was not until mid-1984 that the trains were deemed fit to re-enter active service. By then Politicians, Management, and the public at large had tired of the project. No further trains were to be produced and by 1985 the three non-standard designs were permanently with-drawn.,br />As no further APT’s were forth-coming, development was quickly transferred to replacement technologies involving the Class 91 locomotives and Mark 4 coaches. The tilting mechanism and water turbine braking system were both dropped. Technology derived from the project was ultimately sold to Fiat-Ferroviaria in Italy where it was ultimately employed in the development of the Pendolino sets. Today, some 30-years later, the Class 390 Pendolino sets operate successfully on the WCML. The experimental APT-E can be seen today at the National Railway Museum in York while a complete APT-P set remains at Crewe Heritage Center. A second power car has also survived.